contentACCESS allows to import data from files in the following available file formats: CSV, XML, Tab delimited files and Space delimited files. This simplifies adding of huge amount of data to different configuration sections in contentACCESS instead of entering each entry manually. There’s an option to set if we want to overwrite the existing items, update or skip them. The user may also download a sample file to check if the file that he wishes to import contains all necessary information (column) for the given configuration section. Column names are displayed in the sample file if the “First row is header” option is turned on in the respective importer dialog. Important!!! When importing Email archive and Email restore configuration sections, it is highly recommended to define the mailbox folders to be imported with wildcards (e.g. %INBOX%). Wildcards ensure, that the given mailbox folder (e.g. the “INBOX” folder) will be processed regardless of the language settings of the mailbox. This is important mainly for companies who archive mailboxes using different languages. After browsing the file to be uploaded and configuring the importer, the file can be uploaded. 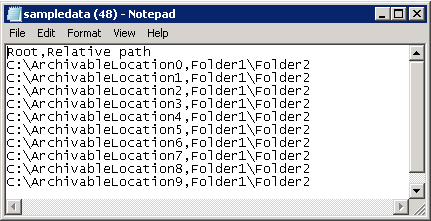 After the initial upload, the file’s columns can be mapped to the importable entry’s fields by dragging the column headers. When the mapping is finished, the newly imported entries will be added to the configuration section. Click the import button on the respective configuration page. The importer dialog opens. From the Import method dropdown list select an import method to be applied (in our case CSV) and download a sample file using the Download sample option. Based on the sample file, prepare the file to import and verify if your prepared file contains all necessary information for the respective configuration section. If the first row of the file is a header, mark the respective checkbox. Further specify the escape character, if such exists in the file. In case that the file to be imported is an XML, no further settings are required. Click Upload selected file to upload the file with the desired items. Click “OK”. The list of imported items will be added to the respective section. In a file containing multiple columns the user may specify, which column should be imported. Simply drag and drop the column header (on the picture below the Database ID header) over the respective column that should be imported.